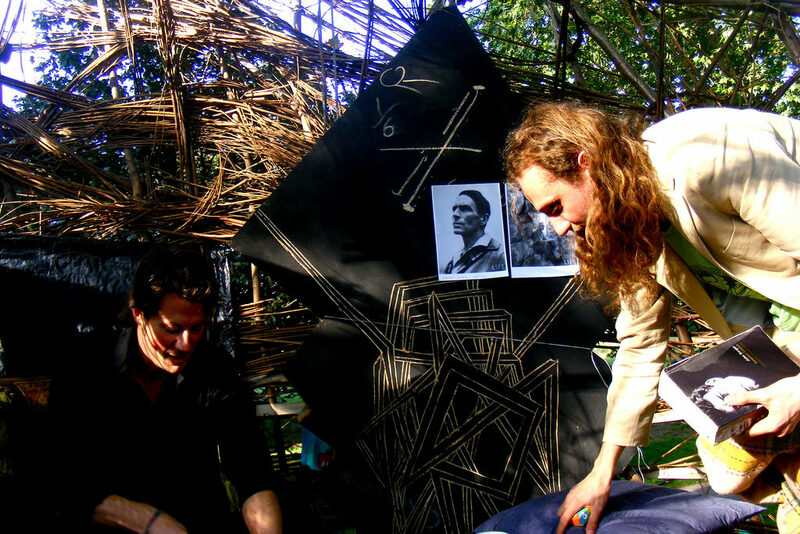 In July 2009, Dougald Hine and Paul Kingsnorth launched the manifesto which became the starting point for this project. Next year, as Dark Mountain enters its second decade, Dougald will be moving on to other projects. In this post, he reflects on his personal journey as a co-founder, his decision to move on – and the past and future of Dark Mountain as a creative collaboration. There’s an old mythic way of thinking about the journey of a life which says that there are three times you will pass through, each with its own colour. You set out in the red time of youth, its raw energy not yet tempered by experience – and with luck, you are headed for the white time of wisdom. But whichever route you find yourself taking, the road that leads from red to white will pass through the black time, when that early raw energy starts to run low, when you are brought up hard against the knowledge of limits and you learn the humbling lessons of failure. They say there have been times and places in which this was recognised and accounted for in the expectations your community would put upon you. On entering the black time, your other duties were taken away and you would join the cinder-biters, whose only task was to lay down by the fire and make sure it did not go out. Who has such a community now? Hardly anyone. And most of us have grown up in a culture which prizes the red time of youth, and may look fondly on the occasional white-haired elder, but would rather not acknowledge the black times. So we struggle through, as best we can – or perhaps we find ourselves in a doctor’s office, being offered pills that promise to take the edge off the darkness. What we’re rarely offered is a story that might help us make sense of the time in which we find ourselves. Ten years ago, when Paul and I were kicking around the draft of what became the Dark Mountain manifesto, neither of us had the tools to think in terms like these. The first I heard of cinder-biters or the three colours of initiation was from the storyteller Martin Shaw, one of the host of friends and teachers and collaborators who came into our lives as a consequence of having written that manifesto. But when I look back now at the beginnings of Dark Mountain, I see two men who stood on either side of a threshold. There’s only five years between us, but we met when I was in the last rush of the red years, having stumbled at last on something I was good at doing, while Paul was already deep in the black. I’m not spilling secrets here; it’s written across those essays of his which led so many readers to this project. The loss of faith in journalism and environmentalism, but also the way ambition turns to ashes: ‘I used to long to be on Newsnight every week, offering up my Very Important Opinions to the world,’ Paul writes, in Issue 2, grimacing at the memory of his younger self. Part of my role in those early years was to serve as a counterweight. I remember a mutual friend suggesting that Dark Mountain had been born out of Paul’s loss of faith and my finding a faith. In what, though? There are traces of it in the manifesto: that insistence on ‘the hope beyond hope’, ‘the paths which lead to the unknown world ahead of us’, and ‘the power of stories in making the world’. ‘It is time to look for new paths and new stories,’ we declare in the manifesto’s closing chapter, announcing our intention to create a journal that will be a home for this work. But as others joined the conversation, they led us to a recognition that the work is as much about recovering old stories, stories from the margins – and, in a phrase I remember hearing in those early conversations, holding ‘the space between stories’: the place where you can slow down, wait a while in the ashes of a story that failed, rather than rush headlong into ‘the new story’ and repeat the same mistakes. the willingness to walk away, even though you have no answers to give when people ask what you would do instead, to walk away with only your uncertainty, rather than to stay with certainties in which you no longer believe. It’s a description of a pattern I saw in Gustavo’s life, but also of a pattern I’d begun to recognise around Dark Mountain. It’s Paul declaring, at the end of his essay in Issue 1: ‘I withdraw … I am leaving. I am going out walking.’ It’s what I understood from those words about ‘the space between stories’. It’s a journey I’ve seen others make over the past ten years: taking leave of hollowed-out stories and certainties in which they could no longer believe, resisting the rush to answers and to action, laying in the ashes for a while. The sun moves across the sky, the seasons change and the face of a mountain shifts; features emerge or pass into shadow. The same thing will happen with an image, different sides of it catch the light in different moods, at different times of life. Long after Paul had introduced me to Robinson Jeffers’ ‘Rearmament’, the poem where he found the image that gave us a name, another aspect began to come into focus. More and more, I found myself drawn to the role that mountains have played as places of retreat, in both the spiritual and the tactical senses of that word. It caught something about the role Dark Mountain seemed to play for many of those to whom it mattered. You come here because it’s a good way back from the frontline. You come here when you’re no longer sure where the lines are drawn, when the maps are shaken and old identities scattered. You come here when it’s time to reflect, to ground yourself again, or to catch the whispering of realities that get drowned out in the street-noise of the everyday world. Maybe you build a shelter for a while, sit around a campfire with strangers who feel like friends, and look back at the orange lights of civilisation: just now, they seem a long way away. But you are not made of granite, peat or heather. There may not be much talk of ashes in the culture I grew up in, but we still know what it means to get ‘burned out’ – and by the time I left England in 2012, three years into the life of this project, I was burning out. I’d spent those red years running around London, bringing together conversations, watching ideas spark, learning to breathe projects into life. I was good with words, but I wasn’t a writer exactly – or not the way that Paul was. My role models were never the solitary romantic figure, the lone truth-teller set against the world; they were collaborators whose work took many forms, John Berger or Ivan Illich, thinkers and storytellers whose words were tangled up with webs of friendship and mutual inspiration. Following the threads I found there, I’d discovered that I could use words to create a space of possibility, a story others would want to step inside. There’s an energy that comes with learning to use your own abilities and finding that you have an effect in the world. Fuelled by self-discovery, you burn brightly – but then one day you realise you’re falling, you have been falling for a while, and only the forward momentum kept you from crashing already. I was lucky. Just as I entered freefall, I met someone who was willing to catch me. I moved countries, shucked off what I could of the responsibilities I’d been carrying, in the name of self-preservation – and over the next eighteen months, my involvement with Dark Mountain was limited to a few weeks of editing and a couple of pieces published in the books. I still occasionally encounter people who think Dark Mountain is a campaign to persuade everyone to give up – on climate activism, on saving the world, on the possibility that there is anything worth doing. Given the picture they seem to have of our project, I always wonder what they imagine could fill the soon-to-be fourteen volumes of that journal we proposed in the manifesto, what could have sustained the love and work of all the editors who have brought those books into being. I don’t remember meeting anyone at Uncivilisation who was seduced into despair by Dark Mountain – although there were those who had been deep in despair when they stumbled on the project, and who found relief in a setting where it was possible to give voice to a loss of faith without feeling judged or isolated. But like the contributors to our books, the temporary community of the festival was disproportionately made up of people who are active in one way or another, whether or not they would identify as activists. Yet here’s the twist: Dark Mountain itself has never been the place from which to act. You come here for something else, something harder to pin down. Something you’ve been missing. to transmit a sense of deep time, of our rough lineage, of wild trees, of the ease and intimacy of talking about Big Subjects, without being heartless, idealistic, or controlling the outcome. This is a picture of the project that I recognise – and in hindsight, there seems to be a line running from that festival report to the role that Charlotte would come to play at the heart of Dark Mountain in the years that followed, bringing a new degree of beauty to the books and shouldering the heavy-lifting of a growing project, as it matured beyond its beginnings. Meanwhile, my burned-out retreat from Dark Mountain came to an end one morning in the spring of 2013. My partner Anna and I arrived to visit Paul in Cumbria – and by chance, our arrival coincided with an email from Michael Hughes, resigning as chair of the Dark Mountain steering group. Michael had set up the first Uncivilisation festival and was our guide through the responsibilities of having started an organisation. Now he was leaving. Paul’s head may not actually have been in his hands, but that’s the way I remember it. And I remember the thoughts that ran through my head: Paul couldn’t go on carrying this much weight, and it wasn’t time for this thing to come to an end, and no one was going to magically ride to our rescue, so I was going to have to step back in. They say what changes, on the far side of the black time, is that you put your life in service of something larger. I may be greyer around the edges than I was ten years ago, but I’m not laying claim to any white-haired wisdom. All I’m saying is, that morning in Ulverston was the first time I chose to put this project ahead of my own interests, and probably the first time I really had to make that kind of choice about anything. I’d given a lot to Dark Mountain before that, but now I was in service to it. This meant teaching myself how to do whatever was needed: replacing the book-by-book crowdfunding with an annual subscription, setting up a cash flow model so we knew that there would be money in the bank to print the books, mediating the tensions that built up between members of a growing team, setting up regular calls so we actually started to function as a team. In an ordinary week, there were others who put more hours into the running of the project, but when a crisis hit – and in those days, it seemed like that was every other month – I was the one who’d interrupt a family holiday, turn down paid work and generally drive those I loved to distraction, as I threw myself into keeping the show on the road. ‘In dreams begins responsibility,’ wrote Yeats. To leave room for making a living, I gave up my role as an editor on the books, and the tasks I was doing now for Dark Mountain were not the things I enjoyed most or was even that good at. But I was here, and it wasn’t time for this to come to an end, and there’s a certain satisfaction that comes with taking responsibility. My answer was no: we weren’t going to do anything, and we certainly weren’t going to sit down now and arrive at a consensus, make a plan of action, organise ourselves into a movement. Probably this scene played itself out in my head, more than anywhere else, but the dynamic was real enough. Over those days together, many of us had felt a quickening, a sense of coming alive – and it was tempting to try to turn this into action. But pledges made in that liminal space are a prescription for disappointment. What was called for wasn’t, couldn’t be, a collective decision forged in a festival tent. Rather, the challenge now was for each of us to take whatever we had found here back to the everyday world, back to the frontlines or backyards or office cubicles that were waiting for us, and see which parts of it survived the journey. However inspired we felt right now, there was no shortcut, and no guarantee which parts of what we were feeling would still make sense on a Monday morning in October. Retreat is not defeat. Retreat is not surrender. A mountain can be a pretty picture on a postcard, or a place you sit alone for days and nights as the layers of your life so far get burned away and you get claimed by something larger. If that should happen to you, then you’ll come back changed. You’ll have lost some of what you thought you were, certain paths will no longer hold the attraction they once did, and you may catch sight of possibilities you couldn’t see before. If you sit for long enough, your eyes adjust. A mountain can be a pretty picture on a postcard, or a place you sit alone for days and nights as the layers of your life so far get burned away and you get claimed by something larger. But none of us can spend our whole lives on a mountain. At the practical level, where dreams give way to responsibilities, none of us makes a full-time living from our work with Dark Mountain. It’s probably healthy that we fit our roles in around other freelance projects, creative commitments and part-time jobs that pay the bills and take us into other worlds. Still, if you take on a role where you’re seen as speaking for the project, where you get written about periodically in the press with varying degrees of accuracy, then inevitably you become identified with it, and it with you. For the best part of ten years, I’ve been one of the Dark Mountain guys. (‘The one you haven’t heard of,’ as I remember Chris T-T described me during his set at the manifesto launch.) And for a while now, I’ve known that my time in this role is coming to an end. I’ve served this project and been blessed by it in more ways than there’s room to tell and I’m ready to move on. I’m ready to head back down the mountain, to take my place again somewhere along ‘the long front’, as Doug Tompkins called it in Issue 3. Here in Sweden, Anna and I are starting a school called HOME, ‘a gathering place and a learning community for those who are drawn to the work of regrowing a living culture’. This is a different task to the one Dark Mountain serves, and there’s a need to be clear about the difference, which is one of the reasons why it’s time to be moving on. I won’t be leaving overnight – there’s still work to finish up, helping the rest of the team to fulfil the promise of this new online home, editing some wonderful pieces that have already been sitting on my desk too long, and getting the business side of running Dark Mountain into as tidy a shape as I can before I go. But next July, I plan to walk the Thames from London to Oxford with my family, to arrive on the tenth anniversary of the manifesto’s publication at the riverside pub where it was launched, to celebrate the occasion with a party to which all friends of this project are invited – and then to wander off to join those friends and collaborators who are already a part of the past of Dark Mountain. For years, I struggled to articulate the asymmetry between my relationship to Dark Mountain and Paul’s. He was always generous in naming me as his co-founder, but he was the one with whom it started. One time, I tried to explain it to a journalist by talking about the idea of ‘the first follower’, from this little video about ‘how a movement starts’: that the critical moment isn’t the guy dancing like a wild thing on the hillside, but the first person who gets up and starts dancing with him. When I read it in print, it came out like I’d proclaimed myself his number one disciple. Then this summer, I realised what it is: for me, Dark Mountain was always a collaboration. Each of us brought years of our thoughts and doubts and inspirations to the beginnings of the project – but for Paul, there had been a time when Dark Mountain only existed in his head, a thing that was brewing, that he knew he would need help to bring about. As I look to the end of my time with this project, then, I find myself thinking about its future as a collaboration. It’s no longer a start-up that hits a potentially terminal crisis every other month. And for a long time now, it’s been sustained by the collective creativity and strength of a team who have taken it further than I’d have believed possible in those early years. At the heart of that team are Charlotte and her partner Mark Watson, both as much in service to this project as I’ve ever been, along with Nick Hunt and Ava Osbiston, and a growing gang of experienced editors, readers and steerers around them. There’s plenty of strength there to carry things forwards – but just as they joined me and Paul and lifted the weight from our shoulders, so others will be needed to join them along the road. The seasons will change, the sun will move across the sky and other features of the mountain come into focus. The image will be read in other ways. There is never only one map you can draw of a given landscape, never only one path that leads across it. I look forward to lifting my eyes from time to time and catching sight of you, all you mountaineers, tracing paths that I would never have thought of taking, until one day you find that it is time for this thing to come to an end – and when that day comes, know that ending is fulfilment and not failure. More details of the celebration of our tenth anniversary will be announced closer to the time. Only for a moment can the lightening reveal the mountain. There is natural sadness at the departure of two founders in quick succession, but perhaps DM is simply finishing childhood now and entering adolescence, just as any other organism grows and moves on. That image of DM as the shaman of the village is beautiful and apt. I hope and believe that future journeys will bring more of the healing our village so desperately needs. Thanks, Dougald, for your decade of work as midwife and nurse to the strange beast that is Dark Mountain. May your new school flourish and nourish. Very well written — and beautifully so. The thought which comes to mind is that it i rare for instigators to provide such an overview. Why might that be? It is indeed the case that there is much enthusiasm for the red phase and little acknowledgement of what follows — other than accounts of burnout. Is there a case for gathering a collection of writings who have come out the other side — not just into the white zone but prepared to reflect on the 3-fold pattern/ There is much quest for insight from the elders, bat I am not sure it is as fruitfully articulated as has been done here. What indeed could others learn from that articulation? I’ve found my way in just as you and Paul are leaving, and though sad, it was your worn path that brought me, and so many others here. Thanks for walking ahead, and I hope to keep following. So wonderful to learn more about you, Dougald. What a journey you have been on…! I’ve signed up for HOME’s newsletter and look forward to updates. I’m so grateful that Dark Mountain existed when I was stumbling around in my own black time and was led here by — well, the DM shaman, I suppose. Thank you, Dougald, for your eloquent essay (and indeed you are a writer! ), and for your generosity to us all in being willing to be of service when you were called. I’m sad that you and Paul are leaving, though I understand. What a lovely gift you’ve left in our hands, in many hands. It’s been so nourishing and sustaining to know there was a place and space shared by other like-minded souls. May it continue to thrive. I wish you and Anna all the best on your new path. This is both most moving and informative essay. Before I write more, I’ll try to resolve my internal conflict between what I thought Dark Mountain was about, (reading the manifesto over and over) and what the book I read after becoming a Mountaineer turned out to be. Maybe it was just a tired book. In these last words of my masters thesis in anthropology at Columbia University, I mention the Dark Mountain Project. The thesis, whose title is, Being Homo sapiens sapiens: An Ironic Tragedy, proposes a theory about why humans have caused the Anthropocene. Heidegger (1947) said, ‘The human being is not the lord of beings, but the shepherd of Being.’ The promise of poietic praxis is that we recast ourselves as shepherds of Being. This could be our true beginning, a transformation of illusion-bound designing into poietic praxis. A path toward such transformation can be found in a small book, Uncivilization , written by Dougald Hine and Paul Kingsnorth (2009). It is the manifesto of the Dark Mountain Project. Contributors to the project see that our grand design of civilization is not working in life’s interest. We are perilously lost as the Anthropocene evidences. The Dark Mountain Project establishes a means of grasping a human potential that has escaped our attention. We can try again. The project invites artists, writers, and all who can hold hope, to share their imagining of how much more humane than we have been, we can become. The last line in Uncivilization is ‘Together, we will find the hope beyond hope, the paths which lead to the unknown world ahead of us. It seems to me that this is the best we can do to prepare for our second journey. We must be quiet now to hear the voice we’ve never heard calling us home to a place we’ve never been. When Dark Mountain appeared on the my horizon in 2012, it felt like the soul-home I’d been yearning for. I managed to attend the last Uncivilization Festival in 2013 and spend a few precious days gathered in the arms of the mythic with unforgettable strangers–soul food I carried back across the ocean, glimpses of what was necessary and possible that I’ve tried to nourish here. I’m so grateful to you, Dougald, for serving through those hard years, for putting together the publications, the web site and the events that continue to encourage and call us to a sense of possibility and meaning in our collective world-grief. Although it’s really sad to accept your departure, it also makes sense and seems like a natural step. I’m excited for your new venture with Anna, which I will follow from a distance, and wish you a fulfilling celebration this summer. Thank you thank you thank you!